I have a love-hate relationship with grocery shopping. I love to do it because I enjoy checking out all the amazing foods and getting new ideas. I hate to do it because I get so frustrated by all the non-food concoctions being advertised as food. I love to do it because I enjoy seeing how much money I can save. I hate doing it because I always want to save money and it hurts sometimes to spend more on the good ingredients I love. Complicated, huh! To solve the problem, late last summer I joined a CSA. This one, in fact. There were only a few weeks left, so I figured it was a good time to just try it out. I loved it!!!! I was so upset when it ended around Thanksgiving, but I signed up for a bigger box for the next season. That left me with the winter to contend with. I did a bit of research and decided on produce delivery services Suburban Organics and The Fruit Guys. I alternated between the two each week, and kept myself in fresh, sometimes organic, sometimes local, sometimes seasonal, produce. It was great all winter, and I will probably do the same thing next year. Luckily, the CSA season has begun again, and I am back to the farm each week, now with little Jemma. I am excited that she will be seeing the farm her food comes from, meeting animals, and enjoying the experience (hopefully!!). I know she is too young to appreciate it much now, but she loves to hear birds making noise and feel the wind, so she is getting something out of it. We picked up our first box last Thursday, so I wanted to clean out our fridge first. The only things left from our previous deliveries were a grapefruit and an avocado. We don’t really like either of these, so I put them together into a salad. Not the best idea, but if you like both you would probably love it! The first thing I did for the salad was to make the dressing. 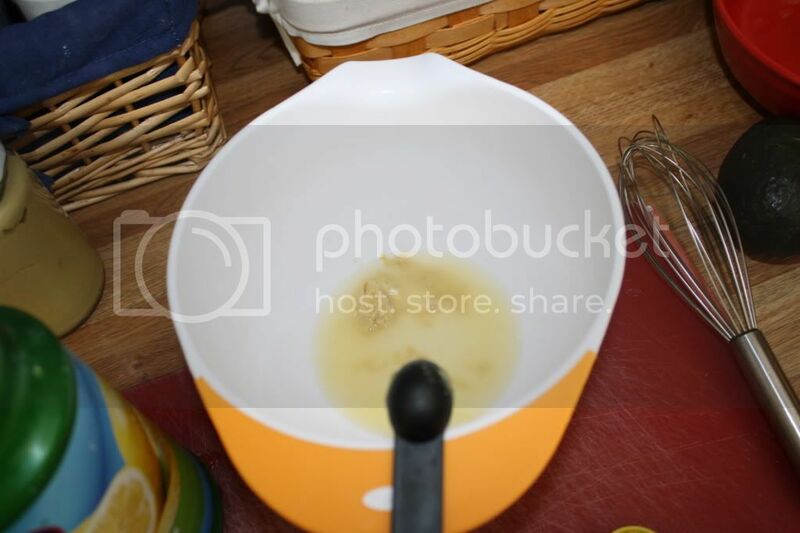 I mixed lemon juice, salt, pepper, dijon mustard, and lemon juice together until it was combined. 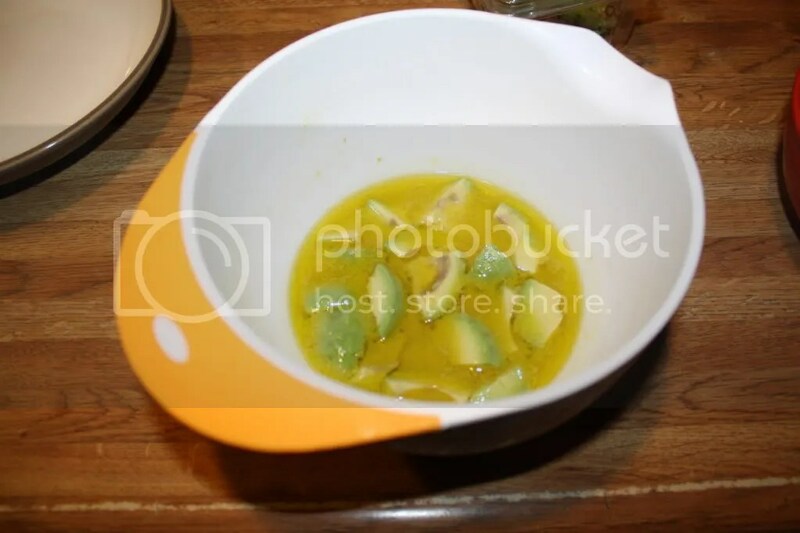 Then, I peeled and sliced an avocado, and put the in the dressing to marinate. Just before dinner, I mixed it with a peeled and sliced grapefruit and some lettuce. 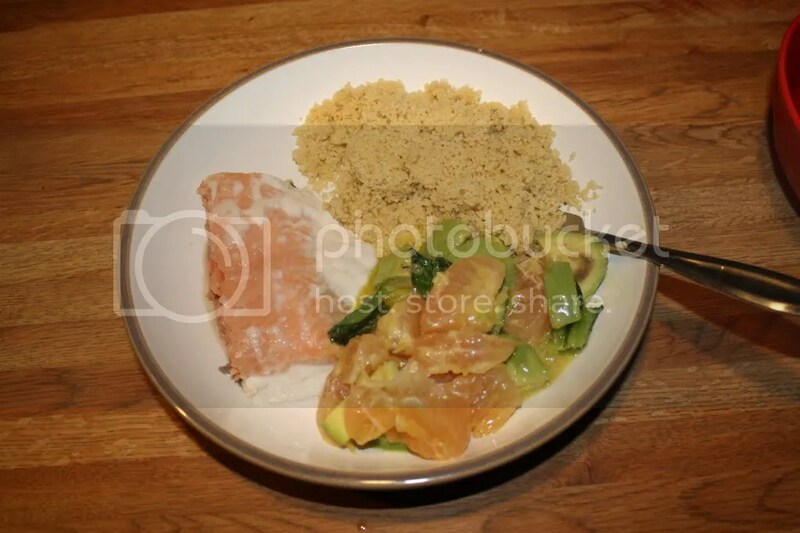 I served the salad with salmon and couscous. There was some extra dressing that I drizzled over the couscous, and that was probably the tastiest part! This post was shared with the Hearth and Soul Hop, Your Green Resource, and Real Food Wednesday! 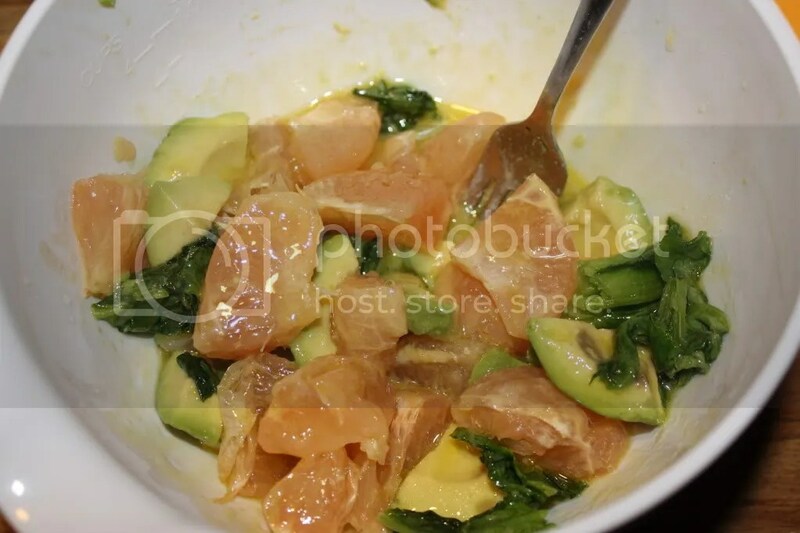 Categories: avocado, couscous, grapefruit, salad, salmon, veggies | Permalink. We have a produce co-op in our area. I love its flexibility because we can choose which weeks we want to participate and which weeks we want to sit out. I buy lot in the winter and cut way back in the summer when my garden is in full swing.